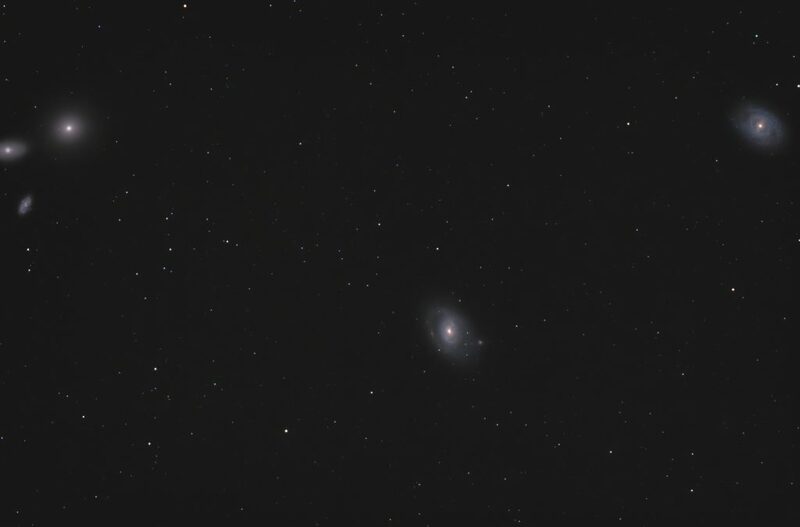 After having success with my NGC7000 mosaic I found some time to get out to the RASC, Halifax Centre’s dark sky observatory to capture the last frame of my second 3 by 3 effort on the Andromeda Galaxy. One of the issues I’ve been struggling with is matching the camera rotation night to night. After having a few clear nights at home I figured out where zero degrees camera rotation lined up and things fell into place. After a little practice I’m now able to line the camera up with just one plate solve and get close enough to shoot multi-night mosaics. As evening fell I headed out to the observatory with my gear. After a pleasant 30 minute drive I arrived as a few other club members were setting up. Lugging 200 pounds of gear from my car and setting up gave me my evening workout and soon it was dark enough to align the scope and acquire a guide star. Firing up the computer and recalling the mosaic in Mosaic Engine the scope quickly moved to my target and thanks to some recent software changes Mosaic Engine was able to control PHD and completely automate the session. Initially I captured eight frames at our cottage over the summer. Unfortunately the Sun came up before I could capture the upper left frame. Since the image was taken at two different times and at two different places I was concerned that stitching in the last frame would be a bit tricky. Turns out I was right to be concerned as the skies at SCO are slightly darker than at my cottage and I had a bit of trouble matching the final frame. Using a lighten blend mode I was able to combine the mosaic with a neutral, dark grey frame with some noise added to flatten the background nicely. To see a higher resolution version, visit my site web page but keep in mind that clicking on the image to download the high res version will cause a large download. All in all not a bad image and it’s been several years in the making. One of my first efforts on this target was the combination of a zoom lens shot and a telescopic shot of the core. This one is a long way from the quality of the mosaic, but it was one of my first digital attempts. With summer vacation at hand my family and I headed to our cottage and some dark skies. Having some decent skies and a few clear nights I got out to take the last row of my North American Nebula mosaic. 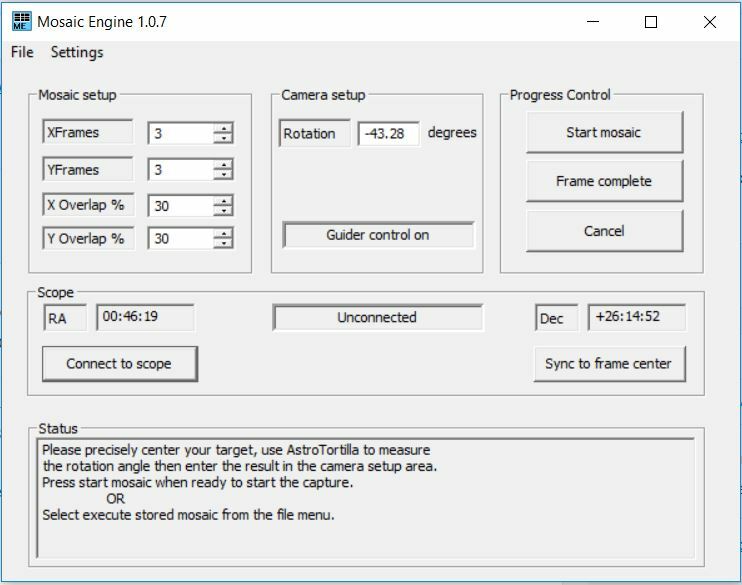 In the process I revamped the user interface to Mosaic Engine, fixed numerous bugs and added a hack to keep the scope motion synched to the image capture. In theory you can now run a completely automated mosaic acquisition after setting everything up, but I admit that I haven’t had time to try that out just yet. The new user interface has had some new functionality added as you can see below. The controls are now logically grouped and the messages from the application now print in the status portion of the window so there is no longer a need to keep closing message boxes. For a more detailed look please visit my web page which has the exposure details and a much higher resolution version of the image. 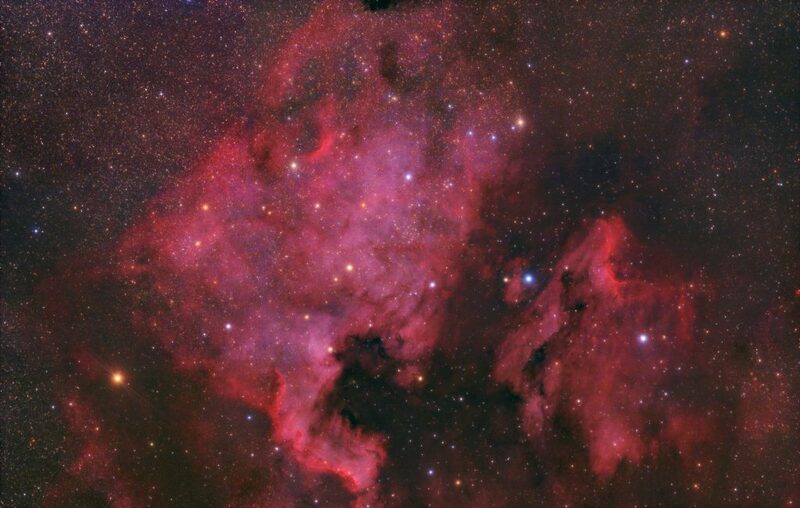 NGC7000 has always been a favorite target of mine and I’ve imaged it and the Pelican several times. I’ve got widefield images and telescopic shots but I’ve always wanted to take a telescopic shot of the whole North American and Pelican complex. My problem has always been that the field of view through my scopes was too small and even my Rokinon lenses had too short a focal length to give great detail. 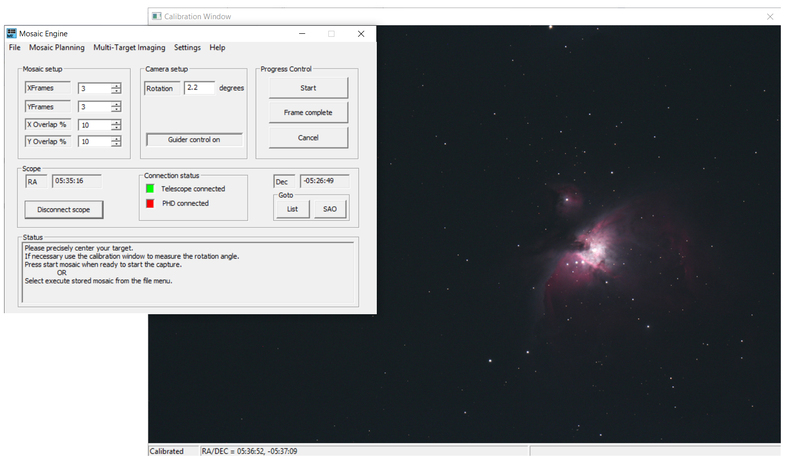 For the last several months I’ve been working on a solution, Mosaic Engine is a software package that controls any ASCOM compatible telescope mount to take wide mosaics of my favorite objects. On 7 July I got out to my favorite dark sky site for a test of the system. My plan was to shoot a 3 by 3 frame mosaic, but the Moon rose before I could finish so I still have three more frames to shoot. So far I’m very pleased with the result. So far the mosaic consists of six frames, each one being a 30 minute stack of five minute subs. The image was captured on a night of very good transparency but only so-so seeing. My software setup used Mosaic Engine to control the scope, PHD2 guiding software to accurately guide allowing Back Yard EOS to acquire the data from my Canon 60Da. I also use Earth Centered Universe (ECU) to provide scope control and show the position of the scope on the sky. ECU is a great planetarium program that focuses on what observers actually need and less on glitz. AstroTortilla provides precise positioning of the mount and measures the rotation of the camera (required by Mosaic Engine). 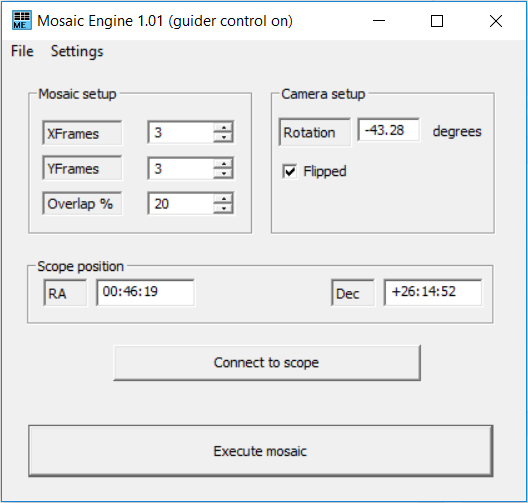 Mosaic Engine calculates the center position of each frame in the mosaic and executes a goto to move the scope for each frame. It also interfaces with PHD to stop guiding before each goto and to reacquire a guide star after the goto completes. The image was captured using a SkyWatcher Esprit 120 APO which produces pinpoint stars to the corner of the frame making it easy to assemble the final mosaic. The image was assembled using Microsoft’s Image Composition Editor (ICE), simply the best mosaic and panorama software I’ve used to date. Once the target is centered, Mosaic Engine acts as the central control hub handling the mount motions and controlling PHD to acquire guide stars for each frame. Using ECU I was able to verify the position of each frame. This allowed me to check on the progress of the mosaic as Mosaic Engine stepped through the entire mosaic. 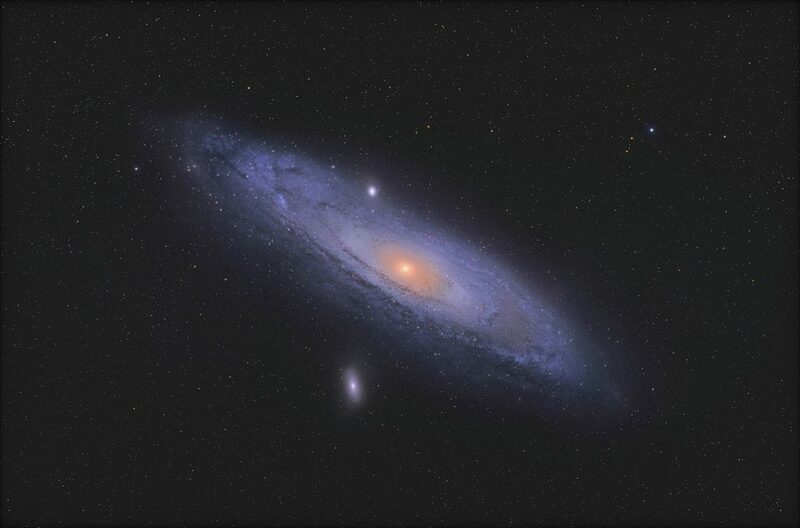 Stay tuned, with summer vacation approaching I’m planning on finishing the mosaic and starting one of M31. Schedule doesn’t always allow for a trip to dark skies so sometimes we just have to make due with urban imaging from the driveway. Here is a daylight view of my urban imaging environment. 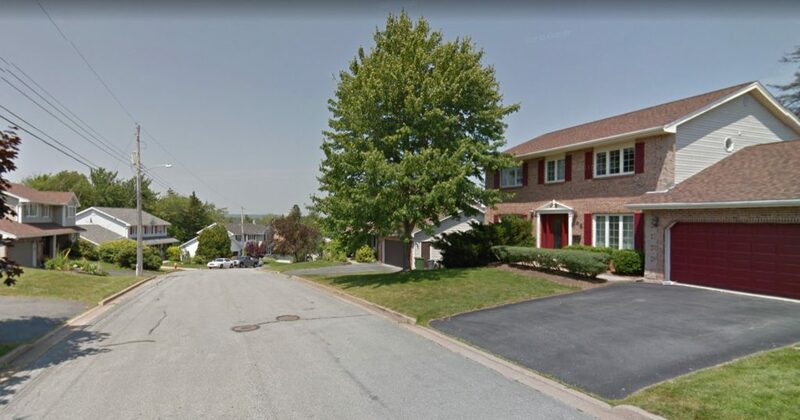 Like a lot of urban sites I’ve got a @#!%$ LED street light right across the street. 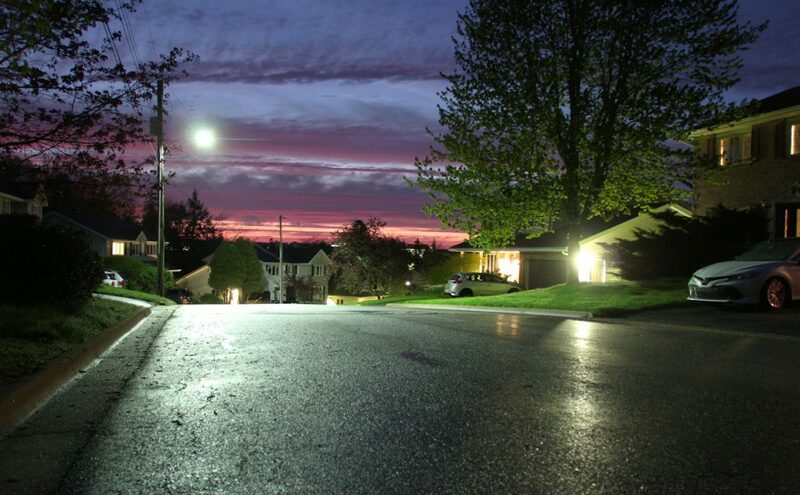 Here’s a night time view, as you can see there is light pollution to spare. Around 8PM a friend and I set up scopes in my driveway and since the tree in my front yard is just starting to have its leaves pop out it wasn’t stopping much of the glare from the LED monster across the street. With the scopes set up and aligned we started imaging. My first target for the evening was Leo1, a very faint satellite galaxy of the Milky Way. This is one of the targets on my imaging challenge bucket list. Not for its low surface brightness, but because it should be resolvable to stars with my equipment. When I started in this hobby well over 20 years ago I decided that I was going to resolve Sirius B, image deep sky objects in another galaxy and resolve stars outside the Milky Way. I was new to the hobby and figured that it shouldn’t take too long once I figured out how to focus the camera. About three years ago I managed to image deep sky objects in M33. A few months ago I managed to catch Sirius B using my latest setup a SkyWatcher Esprit 120 with a Canon 60Da DSLR. After capturing 80 minutes of data on Leo1 I moved the scope to my next target, M108 and the Owl. I figured I’d go for a bright target in case the Leo1 effort didn’t pan out. Processing the Leo1 shot provided to be a challenge. The light pollution proved to be a limiting factor in how far I could push the stretch. After a few false starts I ended up with this image. Leo1 is the faint blue fuzz in the center of the frame. For a better view where you can use your browser to zoom in and have a better look visit my web page on this object. 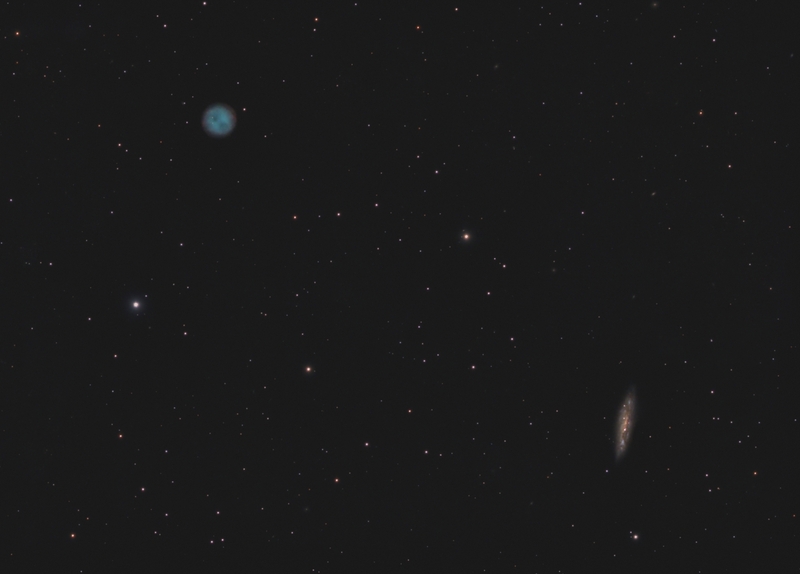 M108 and the Owl Nebula was much easier, but more time consuming, to process. My usual technique requires masked stretches and split star processing, but for this image split star processing really wasn’t necessary so I simply used starless masks to keep the background under control. 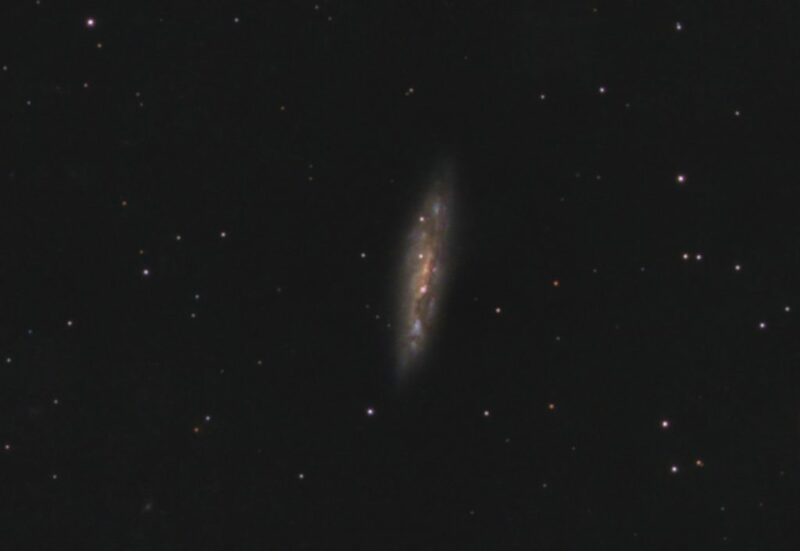 Zooming in on M108 you can see that it is possible to get lots of detail even under light polluted skies. 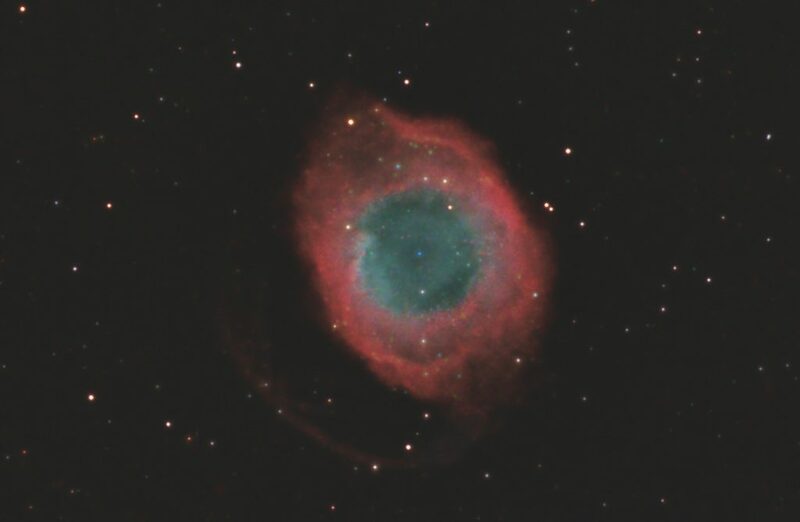 Even the Owl Nebula turned out reasonably well, given that it really needs more exposure and a longer focal length. With these results I may try urban imaging more often. There are several mosaics to tackle that may lend themselves to brighter urban skies. During the dark sky imaging window in October, 2017 I made it out to capture some data on the Helix. Like most of my images it needs more exposure but I played around with processing it anyway. With the Helix having a low surface brightness at my latitude and because of the shorter than optimal exposure, it was very tricky to bring out the nebula. My processing started out with my normal masked arcsinh stretch, but somehow I goofed and ended up with an image that had far too much contrast for the data and the colour was off quite a bit. Now that my schedule allowed a few hours to work on the image again I did some experimenting with the settings I used in the arcsinh stretch. Getting a much better result from the masked stretch I moved on the noise reduction. This got tricky as there was quite a bit of photon noise in the image. The bright sky near the horizon has some light pollution even at our club’s dark sky observatory and the nebula was smack dab in the middle of it. Using the frequency filter in Images Plus and a suitable mask I managed to get most of the noise under control. Having the ability to control the slope of the filter makes all the difference when tackling this type of noise. 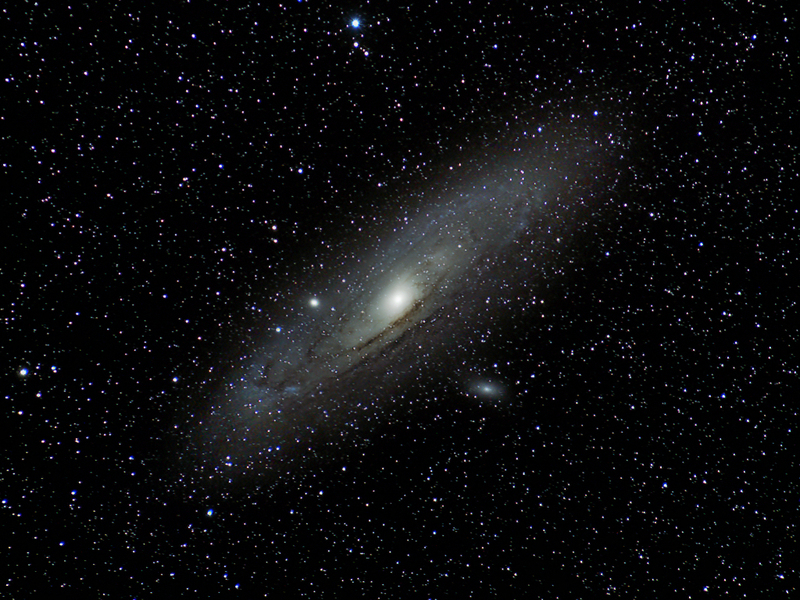 After multi-scale sharpening I ended up with an image that after binning by two wasn’t too bad. A final levels tweak and I finally got a Helix Nebula shot that is worth posting. 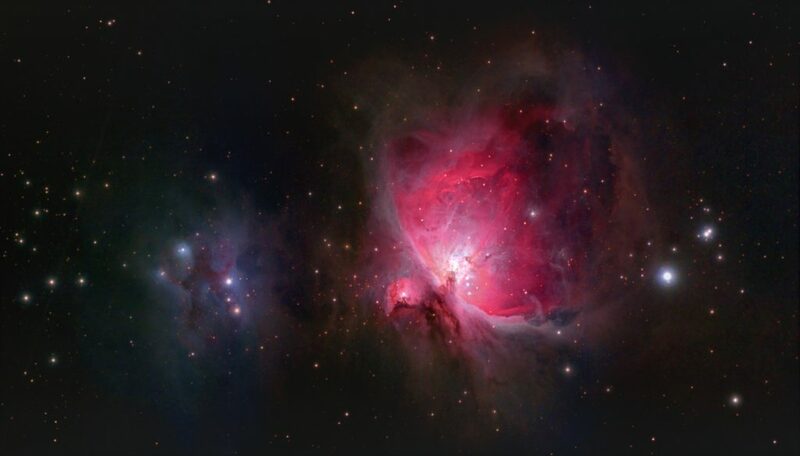 The image was processed entirely in Images Plus using arcsinh stretches, masked noise reduction using a frequency filter, multiscale sharpening and star reduction. For more information visit my webpage detailing the exposure and camera settings as well as a higher resolution version of the final image. It has been a while since I was able to get out to my favorite dark sky site, the St. Croix Observatory. SCO is the club observatory of the Halifax Centre of the RASC and is a fantastic facility under dark (better than 21 mag/arc-second) skies. Between work schedule, winter weather and the Moon I haven’t been to SCO since November of 2017. After driving out to the observatory, a pleasant 30 minute drive north of the city, I started to set up my gear. As this was the first clear night with no Moon to speak of in a while there were several other club members there as well, all eager to start in on their own targets. 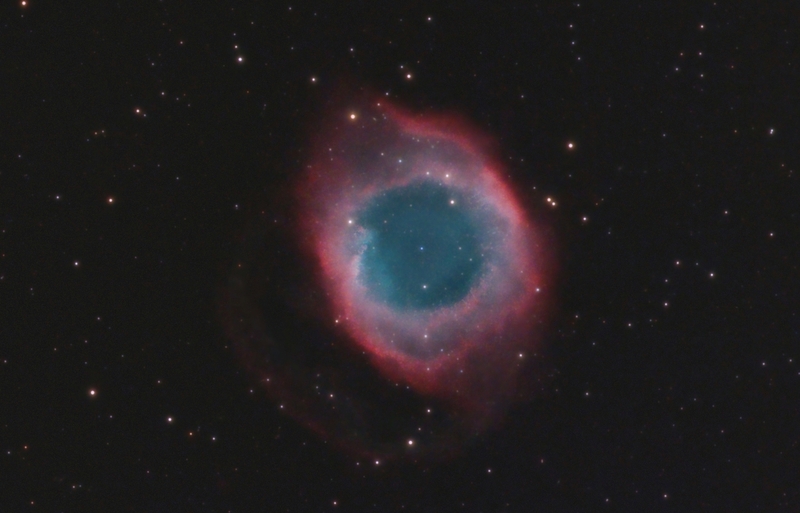 After setting up, sky and polar aligning I started in on centering M96. My plan was to include M95 and several other galaxies in the field. The field I wanted is shown below in a screen capture from ECU. ECU reported a camera rotation angle of 132 degrees. Using Astro-Tortilla I snapped a few short exposures as I rotated the camera to get the desired field rotation. With the camera set, I fine tuned the frame centering and acquired a guide star. One a suitable guide star was found I had to wait for the Moon to set. Around 10:30 I finally turned the system loose and went to the warm room where it was a little more comfortable. Unfortunately, since it was a work day, it had to cut my exposure short after about two hours. Since I was dithering I got about 90 minutes of exposure and grabbed a few darks for hot pixel mapping as I was tearing down the equipment. Although it needs a much longer exposure, hopefully I’ll get out again next month, the shot turned out reasonable well. It is amazing how many galaxies are in the field. I stopped counting at 20 and there are eight across the face of M96 alone, including an edge on spiral embedded in the left spiral arm at about 9 o’clock. After getting proper calibration frames the night before I was able to measure the scale in my images which ended up being 0.315 arc-seconds/pixel. Armed with this and a good image of Rigel which has similar separation to Sirius A & B I headed back out into the cold on February 19, 2018 to try my luck again. This time around I used a sub-exposure of 0.1 seconds which I calculated from the Rigel image below and the difference in brightness between the Rigel and Sirius components. 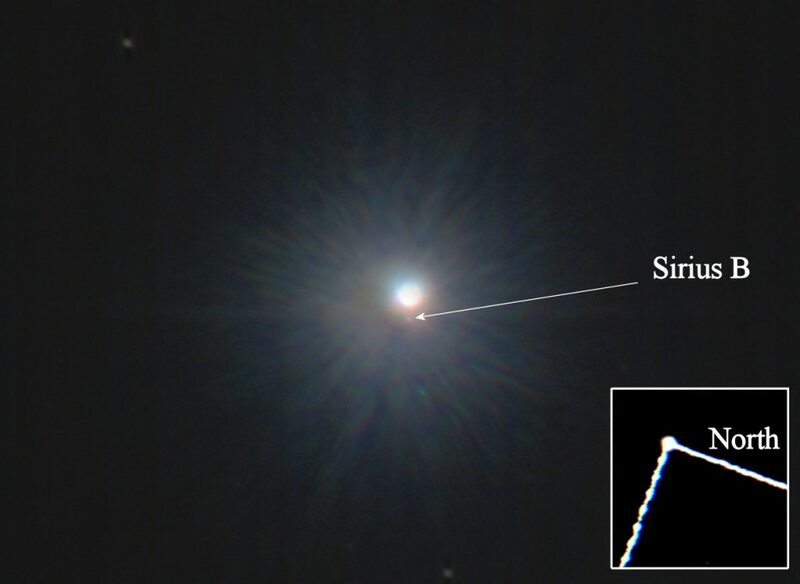 Knowing roughly where to look for Sirius made all the difference. After collecting 122, 0.1 second sub-frames and stacking them to produce a stacked image in Images Plus, an arcsinH stretch was used to bring out the dwarf. Sirius B was just visible in the correct spot so the image was enhanced with sharpening and more contrast stretches. Finally the image was combined with my previous effort to show some field stars along with the resolved binary. Measurements made from the image show that the stars have a separation of 11.3 arc-seconds with a PA of 72 degrees. This compares very well with the RASC Observer’s Handbook value of 10.94 arc-seconds with a PA of 72 degrees. 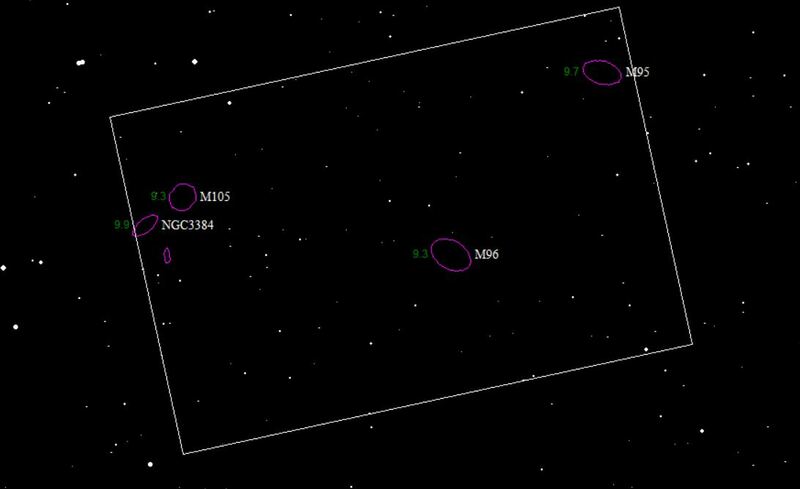 It is interesting to note that the star that I originally thought was Sirius B has been mistaken in several images and sketches I’ve seen, including some on the RASC Sirius B observing challenge page. I’d like to thank Dr. Roy Bishop, a mentor to the whole Halifax RASC Centre, for prompting me to re-examine my original data and to calculate the separation and position angle. If it were not for his coaching I would have made the same mistake as many others and reported the faint, blue star a little less than half way between Sirius A and the bottom of the cropped frame as the white dwarf. Imaging Sirius B has been on my astrophotographical bucket list for some time now. Several years ago I tried with an old Meade SN8, but the scope had some optical issues and although it was a reasonable wide field imaging platform, it just wasn’t up to the task of resolving close binary stars. My next attempt was with a classic 8 inch SkyWatcher Newtonian. I’m still convinced that this system may be able to resolve Sirius B, but I’ve been stymied by the bright halo around the bright A component. The f/5 scope has a large secondary so diffraction is an issue. These days I’m using an Esprit 120 APO refractor and I thought I’d give it another try. The scope is a joy to use with a very stable focuser and great optics. February 15, 2018 around 7:00 PM I rolled the scope on a ScopeBuggy out of our garage and set it up to cool in the driveway. It wouldn’t be until around nine before Sirius cleared the trees so I went back in to watch the news and plan the evening’s attempt. I had downloaded several images that all supposedly showed the dwarf, including one from the national RASC site on the Sirius observing challenge that I was going to use as a reference. Around 8:30 I went back outside and polar aligned the scope, pointed it at Sirius and started up the autoguider, not that easy a task at -12 degrees! Heading back inside I have the advantage of using a VNC connection to my tablet running the scope so I could stay warm for the rest of the evening. Since I had no idea of what exposure would work I tried a variety starting at 30 seconds and reducing in two second increments until I saw something close to Sirius A three frames in a row. I was able to see a faint star with exposures from 10 to 5 seconds so I settled on 8 seconds and shot 64 frames. There was a slight breeze so I used the best 42 and stacked them to produce the image below. Now things were getting exciting, in close to Sirius A is a faint blue star, slightly elongated due to the breeze moving the scope in some of the subframes. This was the same star labelled as the dwarf in all of the images I had downloaded. From here is where everything went wrong. I took a couple of calibration frames where I used a planetarium program to send the mount one arcminute north and took a quick image so I would be able to determine direction in the image. I took another image after sending the scope another arcminute north thinking that the first would run out any backlash in the gearing system and I could use this image to measure scale. Finally I took another image with the north button held down and the shutter open, trusting the mount to move north at the sidereal rate. After working through the math I came up with a position angle of 68 degrees (actual is 72) so I was in the right ballpark. When I checked the separation I got almost 17 arcseconds which was off by quite a bit. This was puzzling so I decided to sleep on it and retake my calibration images on the next clear evening. The next night I planned to take new calibration frames and image Rigel. Rigel is a binary with close to the same separation as Sirius at the moment, but the stars are closer in brightness so resolving the system is much easier. The idea was to use a sequence of images to home in on the correct exposure for the next attempt at Sirius. It turns out that my initial attempts were done with much too long an exposure, saturating the entire area where the dwarf would be located. After determining that two seconds was correct for Rigel, I was able to image and easily resolve Rigel. I took some proper drift shots by exposing for ten seconds with the mount turned off allowing the star to drift through the frame in order to calculate the correct value for the image scale. With the new drift calibration the image scale was found to be 0.315 arcseconds per pixel. I checked the separation on Rigel and got an answer of 9.8 arcseconds with the real value being around 9.5. Much better agreement! 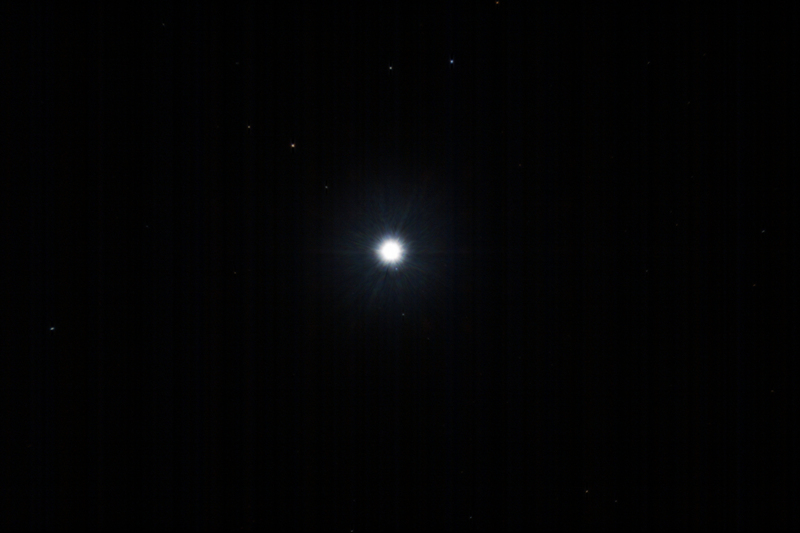 Using the correct image scale of 0.315 arcseconds per pixel I went back to the Sirius image to find that the faint star was definitely not the dwarf. 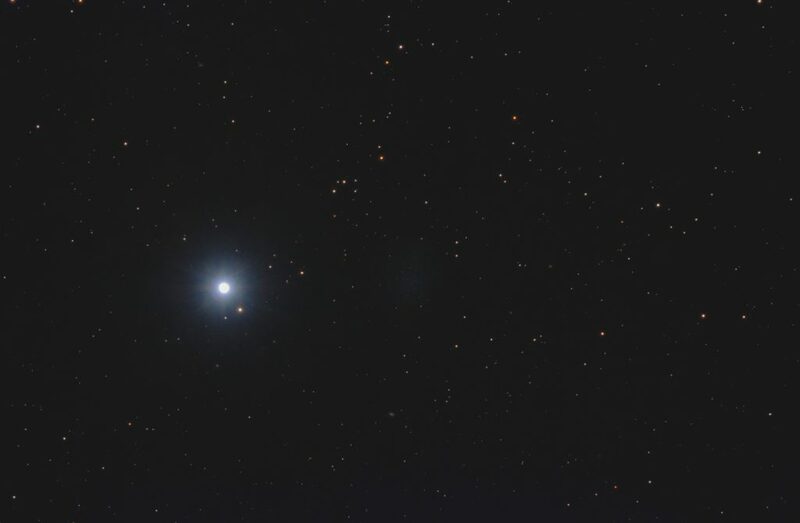 The central crops of Sirius and Rigel, shown above, are both to the same scale. The separation of the two stars in the Rigel system is close to the spacing between Sirius A & B so it is obvious from the two images that the actual dwarf is still within the saturated area of the brighter star. It is interesting to note that the star I had mistaken for the dwarf has been labelled as Sirius B in several images online, including one on the RASC Sirius Observing Challenge page so I’m not alone in my error. Stay tuned as I’m not ready to give up on this one just yet. Since the target is bright, I can keep trying from home whenever it is clear. A fellow astro-imager and I decided to head out to the club observatory for a little photon capturing. As the Sun set we got to work setting up our gear. For a change, the conditions were near perfect – clear skies, great seeing and since it was fall, no bugs! After aligning everything we sat around waiting for the end of twilight. This was a night were I planned on experimenting with AstroTortilla and Backyard EOS. I’ve been working on a mosaic tool that will rely on precisely centering a target before moving the scope for each frame in the mosaic. Since I’ve never needed that level of accuracy before, I took a few minutes to test the setup. After a little tweaking the results were impressive with precise centering of the target. More on the mosaic tool in a future post once I get more of the software up and running. With the AstroTortilla experiment out of the way and darkness settling in, it was time to move the scope over to my target for the evening – NGC891. 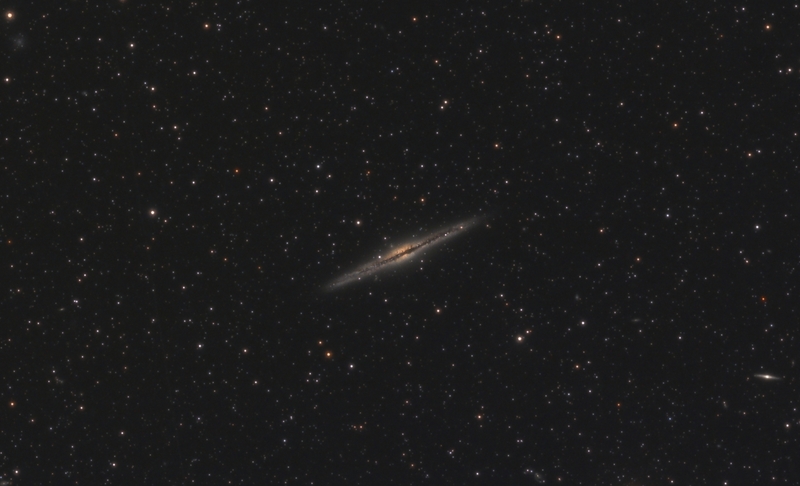 For those not familiar with this galaxy it is the usual faint smudge visually, but photographically it is an edge on spiral with a nicely detailed dust lane 27 million light years distant. Here is a crop of the image made from eight, ten minute subs. Masked stretches were used to help control star bloat and mask noise reduction was used to quiet down any background noise. The feature mask tool in Images Plus makes it easy to generate the starless masks and its RL deconvolution tool was used to sharpen the detail in the dust lane.